The RP653 allows you to capture and share ideas on the fly. The EZWrite 3.0 annotation app, powered with an array of cooperation and annotation tools, is specially designed to inspire your class interaction and participation. 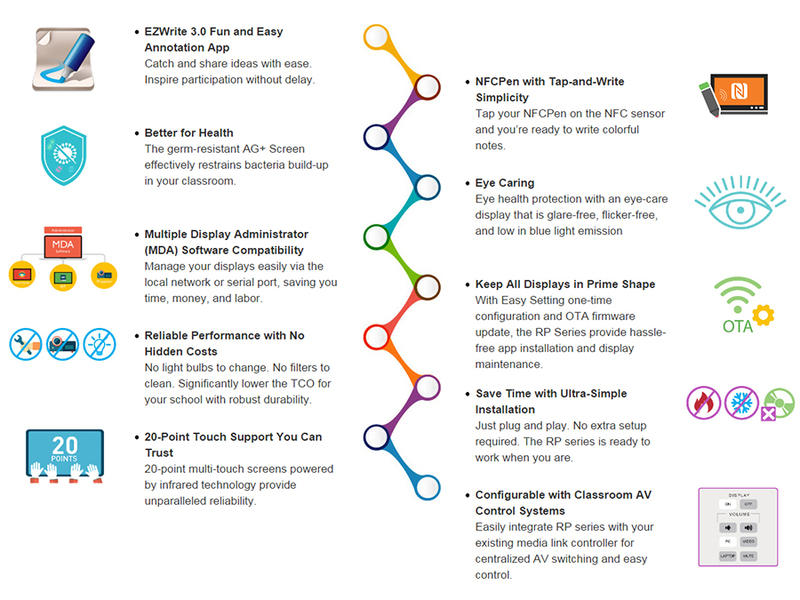 To instantly activate EZWrite 3.0, you can either tap the app on the screen, or simply tap your interactive flat panel''s NFC sensor wth the NFCPen and write your notes. This helps you maintain a smooth teaching flow, free from technical interruptions. Students can immediately enjoy making notes with sorts of colored pencils, highlighters, and backgrounds. To create notes, you can either tap the EZWrite 3.0 app and select tools, or simply tap the NFCPen on the RP653's NFC sensor to launch the app and start writing. EZWrite 3.0's floating toolbar is compatible with any input source and AndroidTM application. The floating on-screen menu lets you immediately change pen colors and take screenshots to enhance class interaction whenever you need it. Save annotations as images and share them as review material through a variety of methods, including QR code, USB, or display's internal memory. Step 1. Choose the color. And tap the NFCPen on the NFC sensor. Step 2. Write on screen with the selected color. NFCPen comes with nearly no maintenance cost Built with NFC technology, NFCPen is battery-free and doesn't require device pairing. Made of reliable materials, it is water-proof and built to withstand long-term use. When you're done with NFCPen, you can prevent misplacement by attaching it to the magnetic area on the lower bezel of your RP653. When it comes to effective learning environment, health matters. 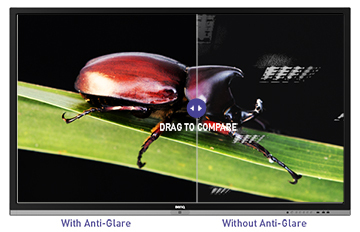 That's why our RP653's touchscreen comes with AG+ Screens and total Eye-care solution to curb bacterial build up*, reduce blue light emissions, and relieve eye fatigue. To protect students' vision, BenQ RP653 has armed with anti-glare surface to reduce screen reflections, providing students with more legible texts. 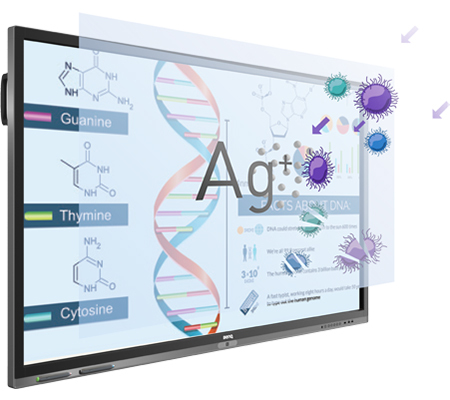 In search of the upmost healthy learning environment, BenQ RP653 further introduces AG+ Screen to enhance anti-glare surface with germ-resistant performance. Every time a touch screen is swiped or tapped, it accumulates germs. 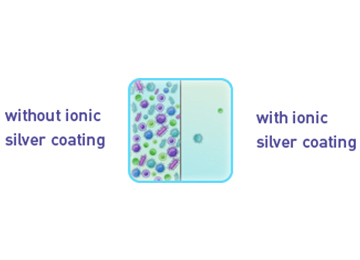 The AG+ Screen is coated with the ionic silver (Ag+) agent which can kill most bacteria* on contact by disrupting their cell division mechanism. This can effectively block the spread of bacteria in your classroom. SGS is the world's leading inspection and verification company, providing internationally approved testing services to verify product quality and performance. Placing our trust SGS's best-in-class facilities and world-recognized integrity, we had their experts rigidly evaluate the screen's antimicrobial efficacy. Proved by the JIS Z 2801:2010 testing methods, the result shows that BenQ's AG+ Screen can effectively restrain the growth of Escherichia coli and Staphylococcus aureus. To maintain antimicrobial efficacy, please frequently wipe your touch screen with a clean, soft, lint-free cloth moisturized with a neutral detergent. Blue-light emissions from displays may cause adverse health effects such as macular degeneration or disrupted melatonin secretion. 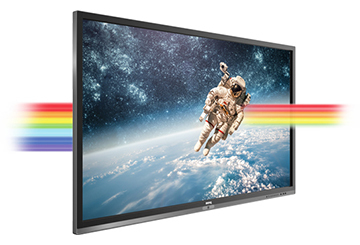 BenQ's Low Blue Light technology minimizes blue-light exposure and allows for healthier time spent in front of the display, helping you create the best and most comfortable viewing experience for you and your students. 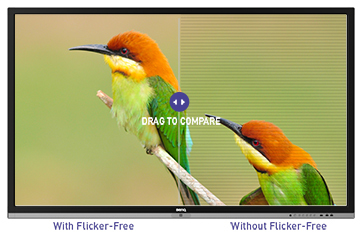 With rapidly changing pixels through the backlight for constant image, LCD displays can cause small fluctuations in brightness, called flicker, which is the main cause for eye strain and visual fatigue, BenQ's Flicker-Free technology is meticulously designed to remove LED backlight flickering and provides a zero-flicker viewing experience. This effectively reduces CVS-related eye problems and alleviates discomfort caused by looking at the screen all day. Screen glare can cause reflected images on the screen, making it challenging for students to see, take notes, and remain focused. 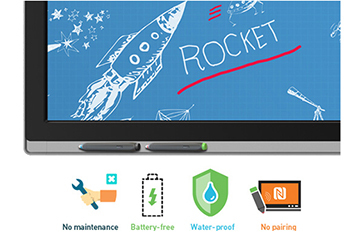 The RP653's anti-glare glass surface can effectively reduce reflections, freeing students from excessive squinting with more legible text and clearer images, avoiding eye strain and facilitating more effective instruction. Both Flicker-free technology and Low Blue Light technology have been rigorously tested by world-renowned TÜV Rheinland experts for true effectiveness on eliminating flickering and effectively reducing low blue light emission by our displays. 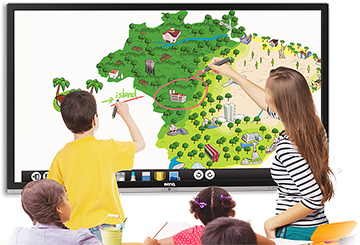 The RP653's 20-point multi-touch support, the leading pioneer on the market, means more students can participate at once. Students can do everything from creating artwork to playing the piano together and other sorts of highly engaging activities. A stunning full HD image performance ensures sharp viewing clarity for subjects that require visual demonstration of detail-oriented images, such as Biology, Chemistry, and Fine Arts. 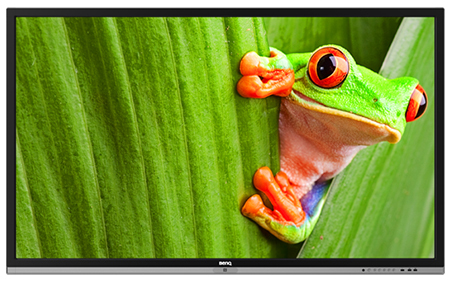 The RP653's rich images will engross your students from the moment you turn it on. 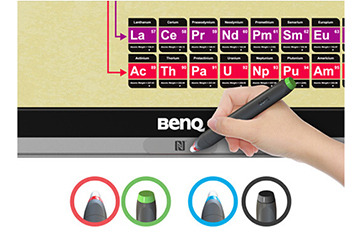 For uninterrupted teaching, BenQ has integrated several features into display's design for quick and easy access. The NFC sensor is located at the lower bezel of the RP653. Within a simple tap with NFCPen, you can instantly activate the EZWrite 3.0 annotate app. The RP653 can save you from the hassles of complicated setup. 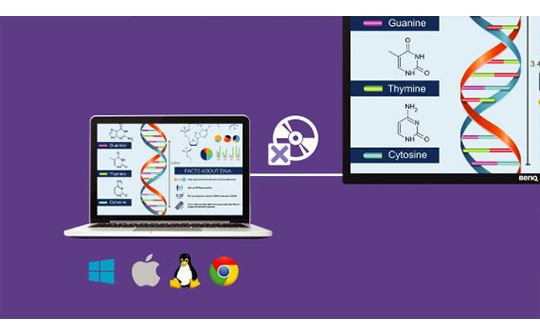 Just save your teaching materials to a USB flash drive and connect it to a PC, and then you're all set to deliver compelling IFP touch-enhanced lessons. By plugging in BenQ's QCast HDMI streaming dongle, you can stream digital contents from smart device to the screen. Your smart device can also remotely control the display of video, movie, document, and website. 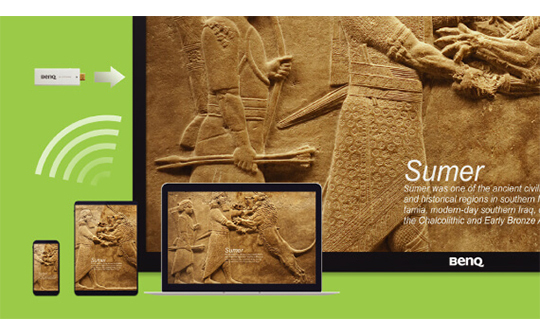 Other connection methods include Miracast mirror display, cloud streaming via DLNA, and local file display via Wi-Fi. 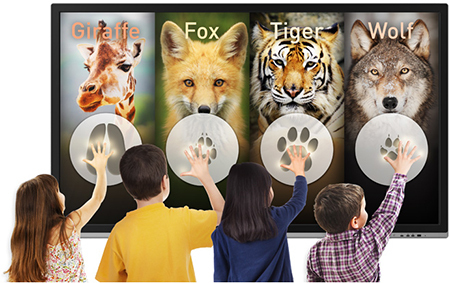 The RP653 is compatible with mainstream interactive educational software. 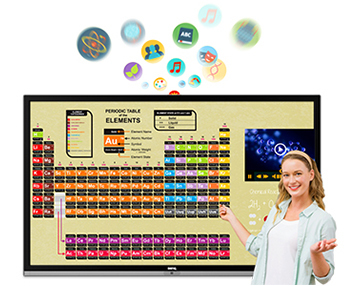 Teachers can use the software tools they're familiar with while enjoying the best hardware experience from BenQ.